VENUE: Coláiste na Sceilge, Cahersiveen. The Pope’s Astronomer, Bro. 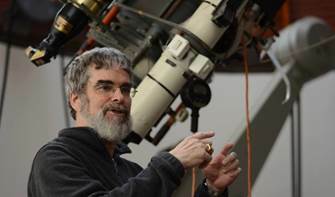 Guy Consolmagno, S.J., Director of the Vatican Observatory, will visit the Kerry International Dark Sky Reserve on Tuesday, October 17th. 2017. He will deliver a public lecture that evening at 8.00pm in Coláiste na Sceilge, Cahersiveen; entitled “The Heavens Proclaim: Astronomy and the Vatican”. Br. Guy Consolmagno is a Jesuit brother and a planetary scientist at the Vatican Observatory, who divides his time between observatories in Rome and in Arizona, USA . His work brings him around the world to dozens of countries and every continent. He is the author of numerous books on Astronomy and Science and the Church, including “Turn Left at Orion: Hundreds of Night Sky Objects to See in a Home Telescope – and How to Find Them” which he co-wrote with Dan Davis. This book is used by many amateur astronomers as their guide to the night skies.